Aided by renowned Italian designers and business experts from the EU-funded Creative Mediterranean project, a group of young Jordanians drew inspiration from a 150-year-old ethnic dress at Jordan Museum to create a fashion line based on a fusion between charm of the east and elegance of the west. The outcome was resounding. The designers passed their first exam with flying colours following the great impression they made at international fashion shows such as Milan, London and Paris. The brand JO! has attracted considerable interest from design gurus and fashion houses but they continue to wait for the actual product to hit the shelves as production has been inexplicably delayed. “We are aiming big. We want to take Jordan all around the world,” said Zain Mango, who worked on developing the product, from the project’s tiny studio in west Amman, where the seeds of the first fashion house were planted. In this very room, the team worked tirelessly for over a year to produce their first line, which could appeal to foreign markets. Creative Jordan was implemented thanks to the regional programme ‘Resilience through Creativity,’ with the support of the Italian Development Cooperation and the European Union. The designing team opted for denim because "it is practical to wear at any given time of the day", said Dina Maqdah, one of the designers. "The brand JO!, with its lively colours and geometrical embroidery on denim,represents a contemporary, easy to wear and practical choice. Denim has no season, no age, men, women and children can wear it,”she added, noting that the intricate embroidery stitches have been reproduced with a modern look, using technology to re-invent patterns with a modern flavour. “The shapes of the dresses are basic, square, with angular patterns, super easy to wear by different people on different occasions” she added. 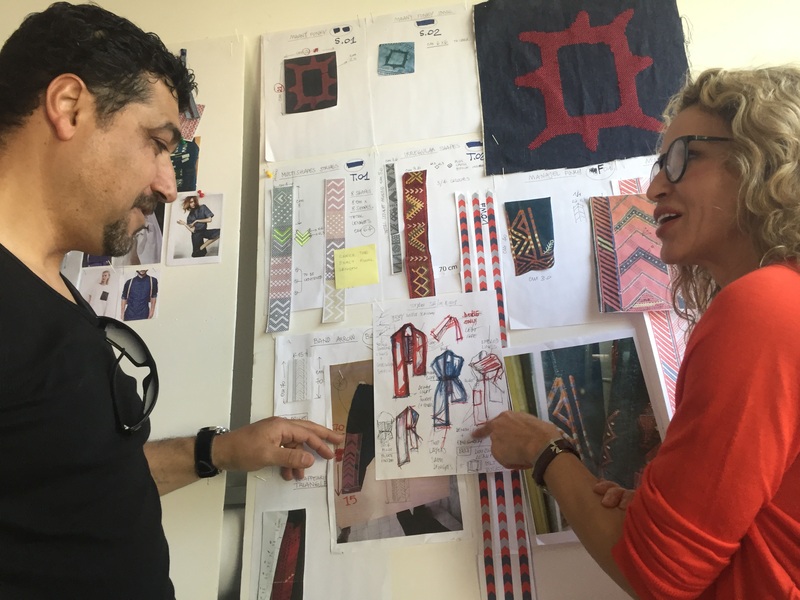 "One of the main gains of the project is building a foundation for the growth of the fashion design industry in the kingdom, to attract young aspiring Jordanians to join the Creative Jordan team," said Maqdeh. In a country where unemployment is high and poverty on the rise, such a project could help create new jobs. "This project is the start of a proper fashion house, with all its elements, from design to selecting fabrics and marketing. The fashion house would welcome anybody who has the talent and desire to work in this sector," she added. The idea, implemented by the United Nations Organisation for Industrial Development (UNIDO), was to create local business clusters to improve the access of Mediterranean countries to international markets and preserve local heritage in an area plagued with turmoil and economic difficulties. Hopes are high that if JO! succeeds, it will encourage other designers to follow the same path,and gradually to develop a professional fashion design industry that creates job opportunities, providing added value for the national economy in general, and the textile industry in particular. Omar Fanek, UNIDO project coordinator, described the pilot project as a significant step towards improving conditions in this sector, while preserving local heritage. It is still early to tell if the project will turn into a success story, but Fanek believes the team is on the right path. “So far, JO! is on the right path and has successfully built a very good reputation in local and international markets. New brands usually need 3 to 4 collections to establish a solid base in the market, from the feedback received,” said Fanek. In the early 1990s, the Jordanian textile industry witnessed a boom following a ground-breaking free trade agreement with the US, which came as an incentive for signing the Wadi Araba peace treaty with Israel. Dozens of factories were set up in the qualified industrial zone to export top brands to the US including Levis, Banana republic, Gap and many others. But as years passed by, experts began casting doubt on the feasibility of the free trade agreement with the US, based on the fact that most factories were owned by foreign investors who hired expatriates from Asia to do the manual work, leaving the state with little added value in a country that imports most of its industrial inputs, including fabrics and fuel. Meanwhile, factories producing for the local market have been facing difficulties due to strong competition from Chinese products, high taxation and the lack of natural resources including fabrics and water.Dozens of factories have shut down or transferred to other markets, causing the state to lose millions in revenues. Remaining factories find it difficult to break into the EU market due to strict rules of origin regulations in the trade agreement with the kingdom. Project manager Ameed Abdel Qader believes Jordan can turn into a regional hub for the fashion industry given proper funding and marketing strategies. According to Ameed, a significant added value of the project is that it will eventually be able to employ Jordanians. "Jordanians are working on everything, from the design all the way to the product development, resulting in lower overall production costs, thus allowing a more competitive price and higher margin,” he added, noting that foreign brands often spend a large margin of their revenues on product development at facilities abroad, but brand JO! is carrying out the entire process at home. As for Creative Jordan, the team is focused on bringing the clothing line to the production phase, and is preparing for 2017/2018 spring/summer, according to Abdel Qader. “Our main challenge today is to produce the collection to have it available for showrooms and retailers on the local and international market,” he added. Abdel Qader believes Jordan can take advantage of regional agreements such as the Agadir Agreement to access the EU market, despite the fact that Jordan is not a country that produces fabric due to limited natural resources. However, despite the promise JO! has shown, the actual production is yet to commence. Observers are concerned that if no product is introduced in the near future, previous efforts of marketing and exposure would go to waste. For now, team leaders need to role their sleeves and introduce their product to the local market as soon as possible. The creation of a local fashion house could ultimately narrow the gap between the designers and manufacturers in order to improve revenues, he claimed. “Local factories are copying items from abroad and selling them in Jordan.In Creative Jordan, we can give them ideas and use their facilities to create and export,” he added, calling on industrialists and decision makers to come together to set up a strategy to save the textile industry from its current doldrums.